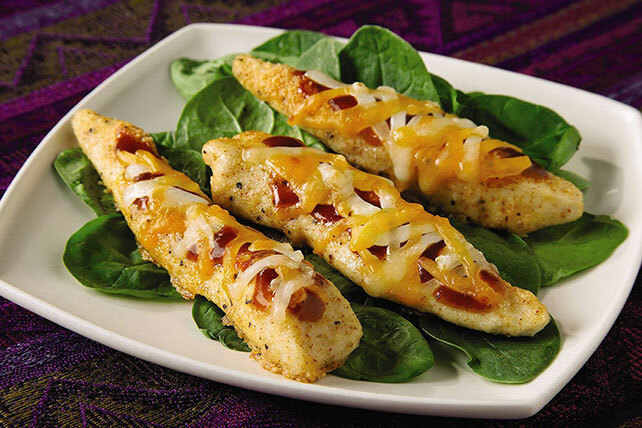 A bed of spinach leaves topped with Parmesan-encrusted chicken and a sugar-free BBQ sauce is a Healthy Living recipe done right. Mix Parmesan and seasonings. Add to chicken; toss to coat. Place in shallow pan. Bake 10 to 15 min. or until chicken is done; top with barbecue sauce and cheese. Bake 5 min. or until cheese is melted. A little Parmesan goes a long way! This flavorful cheese is a great finishing touch for pasta dishes, risotto, meat and vegetable dishes and your favorite salads. Place frozen chicken under cold running water to thaw. Be sure to use cold water and keep the chicken in its original wrap or place in water-tight resealable plastic bag while thawing it. Also, be careful not to cross-contaminate other food products, work surfaces or utensils with the dripping water.